Directions for Soup: Preheat oven to 400°F. Peel away any of the excess papery skins from the garlic cloves, leaving the skin of the cloves intact. Slice off about 1/4-inch of the pointed end of the garlic bulbs to reveal the cloves. Set both heads onto a large piece of foil and drizzle 1 teaspoon of olive oil over the exposed cloves, then wrap the foil around, crimping the edges, to enclose the garlic. Place mini-potatoes on a large sheet of foil. Drizzle 1 teaspoon olive oil over all, then wrap the foil around, crimping the edges, to enclose the potatoes. Place both foil packets into the oven and bake until soft, abut 40 to 45 minutes. Remove and let cool for 10 minutes. Squeeze cloves to remove the garlic pulp and set aside. In a large Dutch oven, heat 2 teaspoon oil over medium-high. Stir in onion and cook until softened, about 4 to 6 minutes. Season with fresh ground black pepper and salt. Stir in cubed Yukon potato and cook for 2 minutes. Pour in broth and bring mixture to a boil. Reduce heat and simmer, stirring occasionally, until the potatoes are very tender, about 18 to 20 minutes. Remove from the heat and stir in garlic pulp. Using a potato masher, mash potatoes only till you still have some chunks. Stir in half-and-half and grated cheese. Place the pot back over medium heat and cook, stirring often, until thoroughly heated through, about 5 minutes. Directions for Topping: In a large skillet, heat 2 teaspoon oil over medium. Stir in onion and mini-sweet peppers, season lightly with salt. Cook until softened, about 4 to 6 minutes. Add sausage and mini-potatoes, cook, stirring to crumble, until the meat has browned and cooked through, about 8 to 10 minutes. 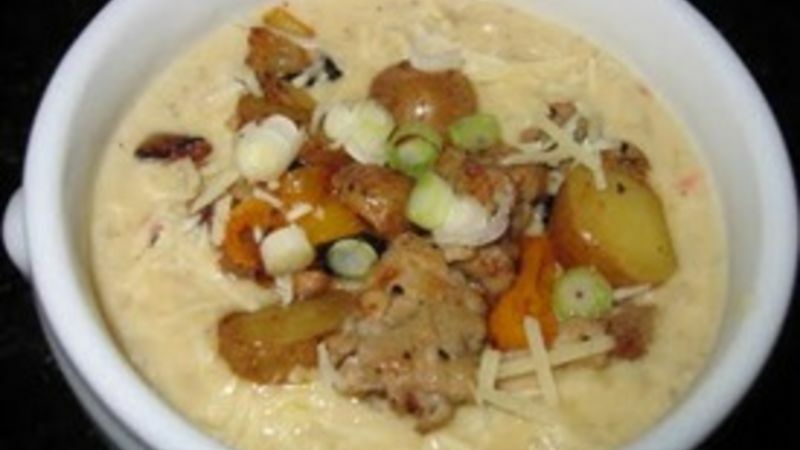 To serve, portion soup into bowls, Top each bowl with a large spoonful of sausage and mini-potato mixture. Sprinkle with Romano cheese and green onions.